The HQD1600 recorder delivers high quality, real time digital video recording even when using all sixteen channels. Its nine MPEG-4 compression engines provide clear, high resolution video and audio, while optimizing hard disk space. TheHQD1600 recorder complements any existing system. 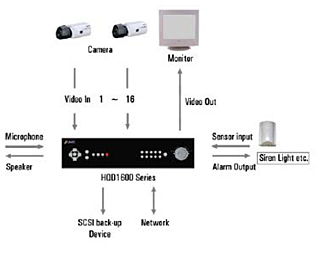 Its nine contact alarm inputs, motion detection, and one-touch record button make it ideal for event recording. With simultaneous Recording, Monitoring, Playback, Remote Monitoring & Archive Video, all controlled from the front panel, the HQD1600 is the perfect spot monitor recorder to enhance an existing analog system. The HQD1600 can record up to around 7days of continuous real time video on all sixteen channels. Total recording time can be expanded ad optimized by connecting optional digital storage arrays, or configuring a combination of four quality settings, and built -in scheduler.